WASHINGTON, D.C. (August 21, 2017)—A new survey of state securities regulators by the North American Securities Administrators Association (NASAA), released today on National Senior Citizens Day, shows that more can be done to protect seniors from financial fraud. 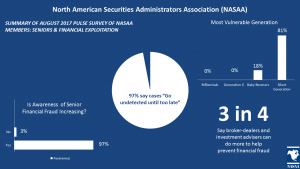 The results come from NASAA’s recent Pulse Survey on senior financial fraud, a poll conducted internally of its members from July 24 to August 4. The findings offer a unique insight into the concerns and perspectives of the securities regulators who are the investment industry’s local cops on the beat. Most Cases Undetected Until Too Late: Regulators overwhelmingly (97 percent) feel that most cases of senior financial fraud go undetected rather than being discovered before they cause serious problems. Awareness is Increasing: Almost all (97 percent) regulators who responded would say there is greater awareness of senior investment fraud and exploitation now than there was a year ago. However, Fraud is Not Decreasing: Almost no respondents have seen a decrease in cases or complaints involving such fraud, and virtually three-in-ten (29 percent) say their agency has seen an increase in such cases. Industry Must Step Up: Three-fourths of respondents said they feel broker-dealers and investment advisers can do more to help prevent senior fraud. Important Role for Legislators: More than three-fourths of regulators who said their jurisdictions had laws like NASAA’s Model Act to Protect Vulnerable Adults from Financial Exploitation, which can help detect instances of senior financial fraud and make sure they are reported to authorities, were able to prevent senior financial exploitation by stopping the distribution of funds to fraudsters. These findings come in light of another recent survey NASAA released in June that provided insights into the industry perspective on the issues surrounding senior-related practices, procedures and protections from fraud. The June survey looked at the practices of more than 60 broker-dealer firms throughout the United States. Among other findings this study found that more than half (54 percent) of the responding firms lacked a formal policy defining senior customers, and less than half (41 percent) had developed a form for customers to identify an emergency or trusted contact person. Still, while the previous report shows that firms can do more, it also makes clear that they are taking the threat seriously. The broker-dealer firms included in that report alone reported nearly 2,300 cases concerning possible financial abuse or exploitation of seniors to outside authorities in 2015. The report also found that seniors were at higher risk of fraud, as most of the senior abuse cases reported (45 percent) involved customers in the 81-90 year age group. That finding was confirmed by NASAA’s Pulse Survey, in which regulators overwhelmingly identified the “Silent Generation,” (ages 70 and older) as the most vulnerable to financial fraud. For additional information on NASAA initiatives to protect seniors and other vulnerable adults from financial exploitation, please visit NASAA’s Serve Our Seniors website at serveourseniors.org.